Today was an interesting day, not because nothing terribly interesting happened, but because it was very different than the rest of my trip so far. Last night when I rolled into Nashville, there was a nasty thunderstorm going on. It rained much of the night, it was super windy and lightning was all around. It was a very creepy vibe. As I looked at the weather reports for today, the outlook was bleak. Looked like high chances of rain and thunderstorms throughout the day, so I wasn’t sure if I would even get to golf. As I was driving toward Nashville last night, my mind was already beginning to wander. 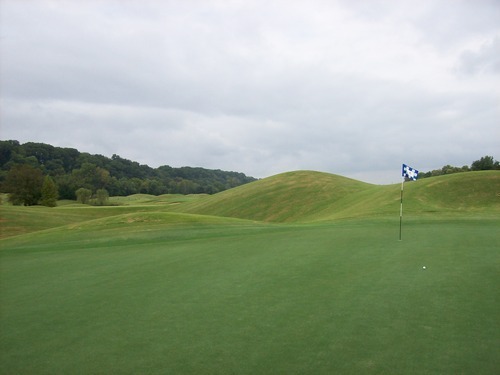 Having been able to play Stonehenge in Tennessee yesterday evening, I was thinking of changing my plans. 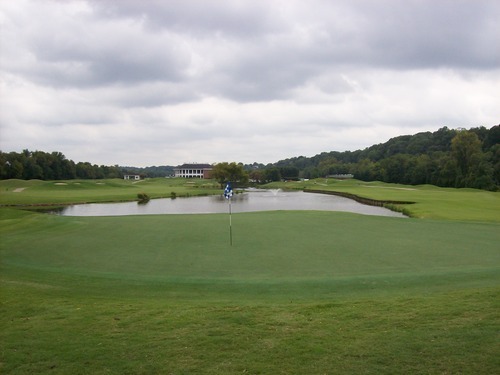 My original plan for today was to play 36 holes at The Hermitage in Nashville. 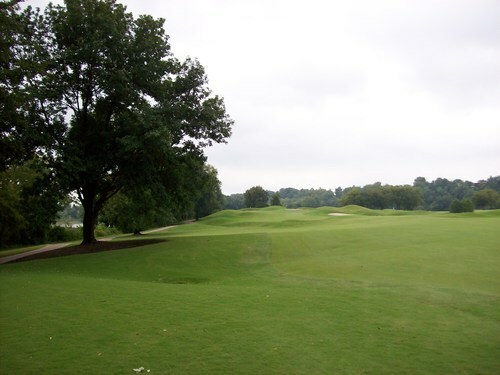 They have two great-looking courses there (President’s Reserve and General’s Retreat). In case you didn’t know, The Hermitage is Andrew Jackson’s home and is located there in Nashville, hence the names of the courses. I could never get a good read on which course was the marquee course at The Hermitage. If you look on their website, it would seem that General’s Retreat is the premier one, having hosted LPGA events and stuff. 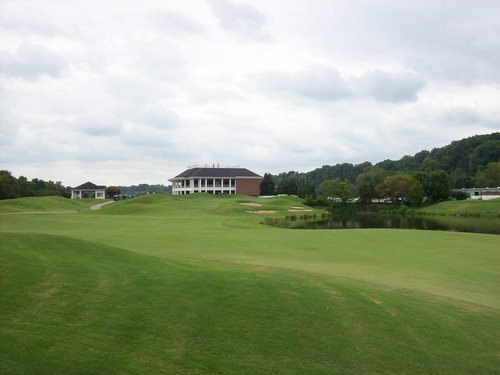 Yet, when I looked at Golf.com’s “best public courses in each state” rankings (which I’ve used a lot in planning these multi-state trips), they listed President’s Reserve as the #3 course in Tennessee. General’s Retreat was not even in the top 5. So I figured I’d just play 36 and get to experience both courses. Another wrench in the works was the availability of the courses today. General’s Retreat had an event going on all morning and didn’t have anything open until almost 2:00. 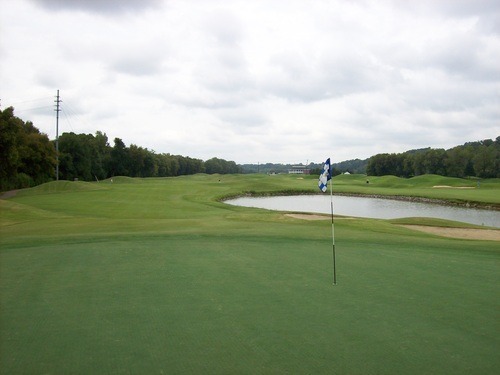 I was planning to play President’s in the morning and hang around as needed to get on General’s in the afternoon, then drive up to Louisville to stay the night. As I drove along, I realized I not only had no desire to play another 36-hole day, but didn’t want to have to wait until the late afternoon to get on the second course (with no assurances I’d even be able to get on it at all). So I began considering sneaking southward in the morning to play in Alabama, or even a bit westward to play in Arkansas (both states I have yet to visit/play). But as I looked up the weather reports in all the different areas, they all looked nasty. I knew I didn’t want to drive so far out of the way for a bad weather round (or even worse a rainout or lightning delay). I decided to just hit the hay last night and see how I was feeling in the morning. I got up around 6:00 and looked outside. The weather was calm and not too bad at all. I looked at the weather report and the thunderstorms had moved into the afternoon. However, I was completely lacking energy and motivation. All I wanted to do was crawl back in bed, and that’s exactly what I did. I finally dragged myself out of bed around 9:00 and was debating whether or not to play at all, even though the weather was cooperating (so far). 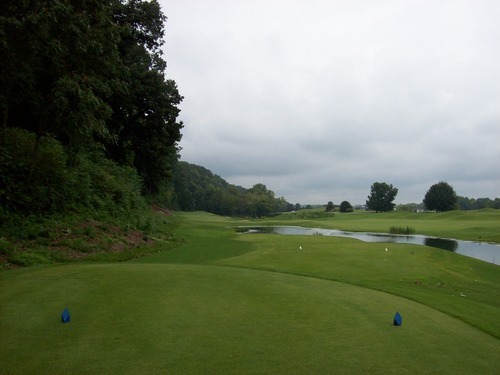 When I got out there, I could see there was hardly anybody out on the course. I asked inside about the weather forecast, and they seemed highly optimistic that nothing was coming anytime soon. And, they let me know I could go right out if I wanted. I kind of didn’t want to, but did anyway. The course turned out to be a solid pick and was different than anything else I have played so far on this trip. 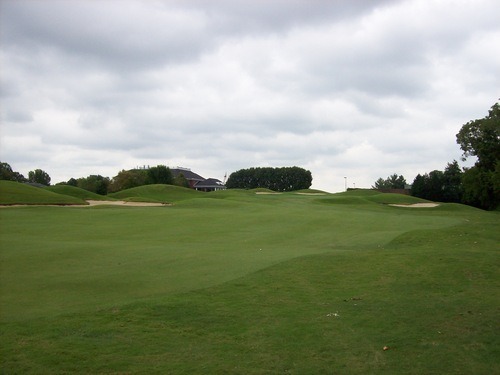 It was designed by former tour player, Larry Nelson, and it’s kind of a modern/American “links” style layout. Overall, the landscape is pretty flat with only a few very minor elevation changes. 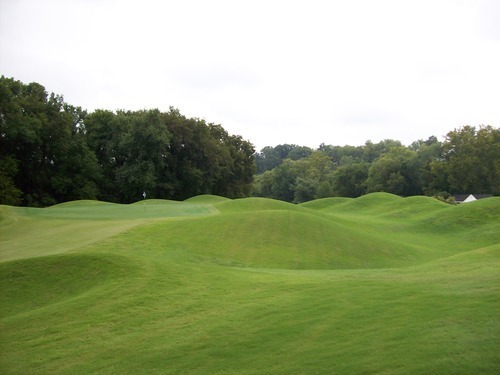 However, there is a lot of severe mounding throughout the course, which gives it a signature look. The fairways zig-zag back and forth mixing very wide landing areas with very narrow ones, so depending on which tees you are playing and how far you can hit your drives, you really have to pay attention and hit it where you want or you’ll be faced with an awkward lie in the rough-laden mounds surrounding the fairways. 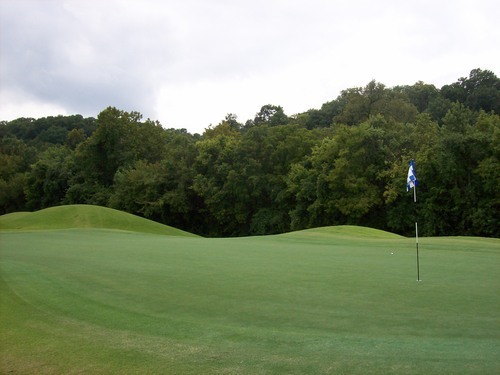 Many of the greens are slightly elevated and protected by big mounds, as well. There are some nasty bunkers guarding many of the greens, but they are relatively easy to avoid. 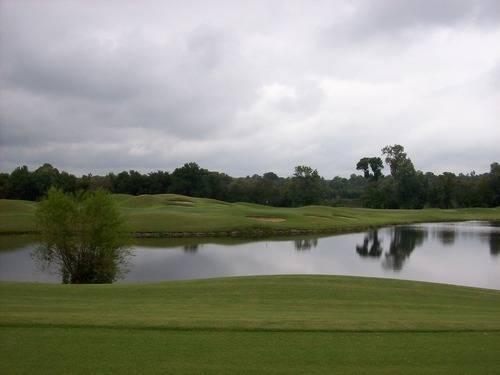 A lot of water comes into play on the course, with a few fun holes that jump back and forth over ponds to create some good risk/reward opportunities. 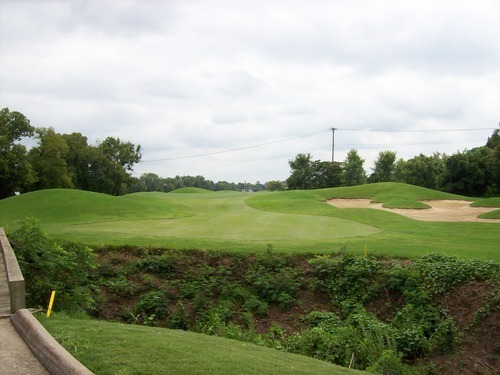 The most notable holes here are the 4th and 5th holes, which both bring water heavily into play off the tee and on your approach. 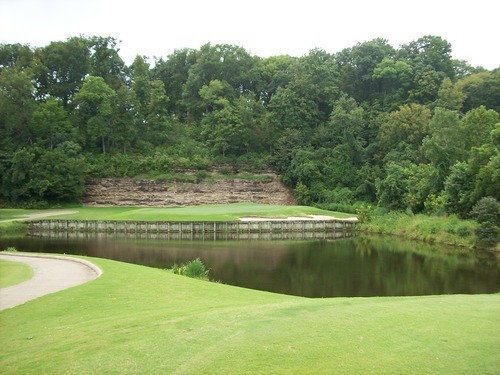 Another great hole is the par-3 14th, which is not a super long hole and features a tee shot over water and a great limestone cathedral framing the hole from behind. Definitely feels like Tennessee with that setting. 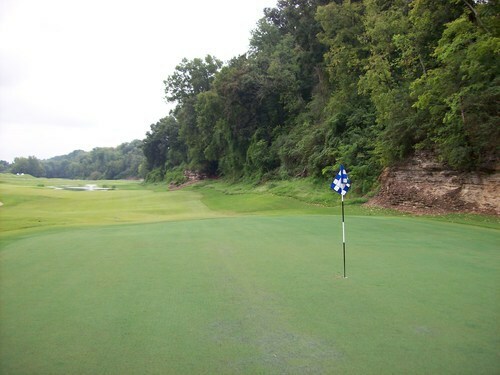 Some of the holes play along the Cumberland River, which also makes for a nice natural environment. The clubhouse is huge and beautiful, done up on the facade to look like a classic plantation-style mansion—a perfect fit here in the south. 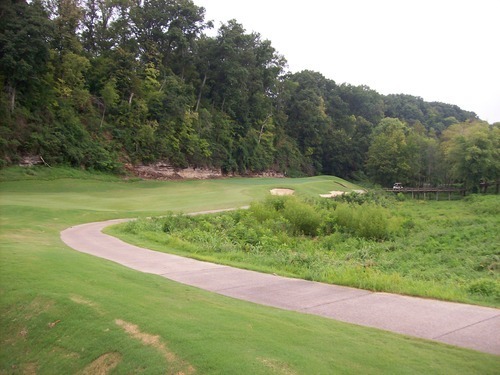 The course was in decent condition overall. It was a little drier than what I’ve become accustomed to on this trip (more like what we’re seeing back home at nicer Southern California courses during these summer months). But overall, it was in nice shape all around. The fairways were manicured well. 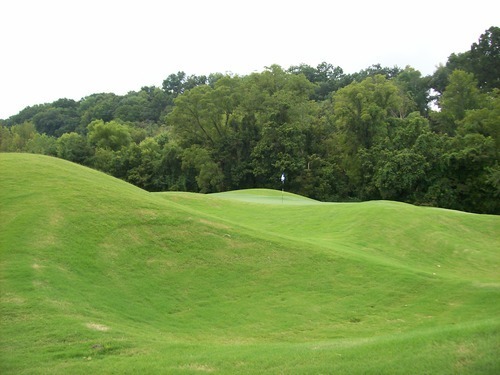 The rough wasn’t super deep, but your ball can sink down and you usually will have an awkward stance amongst the big mounds. 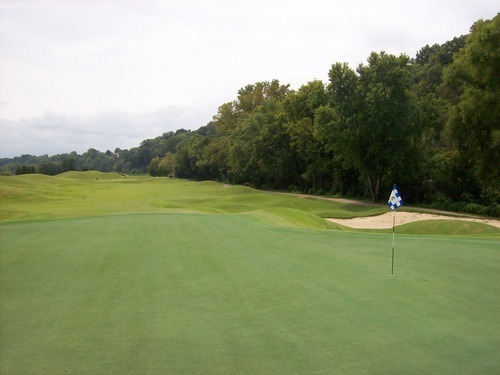 The greens were very firm and VERY fast—quickest speeds I’ve played all week. Even if you thought you hit a nice lag, it would often run an extra 4-5 feet past. For not knowing anything about this course and picking it as a last-minute alternative, I enjoyed the experience out there. 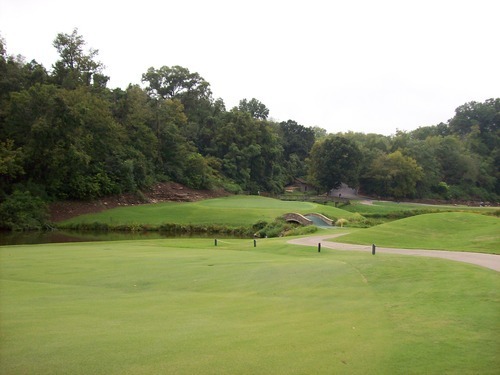 It’s a nice course with a good Southern vibe and solid layout. For $80, it seemed a bit overpriced and the round didn’t go as quickly as I would have hoped. I was paired with another single and we were stuck behind a couple of slower groups. Still only took about four hours, though, and the weather cooperated well (though it was quite muggy, but not bad since the sun never really came out), so I can’t complain too much. 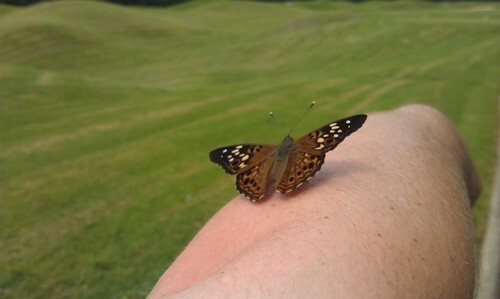 I made a new friend with a butterfly on this course. This little guy just hung out on my arm for like 15 minutes, just licking the salt from my sweat I guess. At least that’s what I hope he was doing! He seemed to be enjoying it, so he stuck around for awhile and I was getting a kick out of it. After the round, I hit the road again. 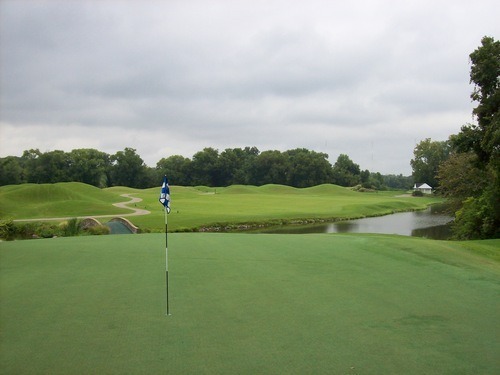 Since I only played one round today, I decided to cancel my reservation in Louisville and push all the way through to Indianapolis. I’ll be flying out of here tomorrow after one final round in this area. More on that later. Even though it was late afternoon during my drive, it was such a long, lazy and dreary morning that I was really craving breakfast. So I stopped at a Waffle House in southern Kentucky (when in Rome, I say) and had a hearty greasy spoon meal with eggs, toast, sausage, hash browns and a waffle, of course. It hit the spot, though if you ever told me I’d ever be sitting in rural Kentucky eating at a Waffle House, I would have thought you were crazy. Last but not least, I had to make a slight pit stop in Louisville. 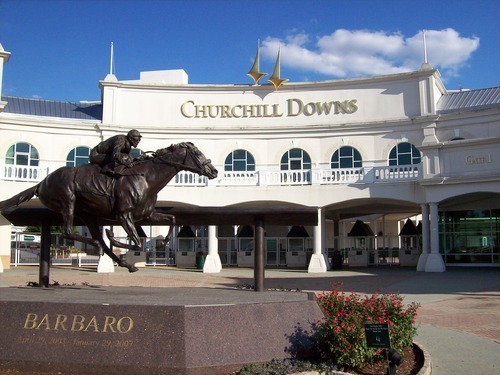 Who knows if I’ll ever get back here again, so it was imperative that I hop off the freeway for a bit and go check out Churchill Downs–home of the Kentucky Derby. It was pretty easy to get to and the parking lot was wide open (no security gates or anything), so I parked right in front of the main entrance and snapped some pictures. I had already been to the world’s most famous auto racetrack (Indianapolis Motor Speedway) at the beginning of the trip, so it was fitting to end the trip by visiting the world’s most famous horse racetrack. Pretty cool to stand there with all the history and tradition that place represents, even if I didn’t get to go inside the gates. The super-quick visit to Churchill Downs is a reminder of the one regret I always have on these trips that are so tightly packed with golf and driving (and blogging). I wish I had more time to do all the touristy things in some of these areas I’m visiting for the first time. Oh well, all the more reason to come back someday after the 50 states goal is complete!